The Holy Cross Sermons: I will go with you! I will go with you! A few weeks ago, I told you a story about my adventures in the Stirling Ranges National Park. I have to say this is a special piece of country for me. 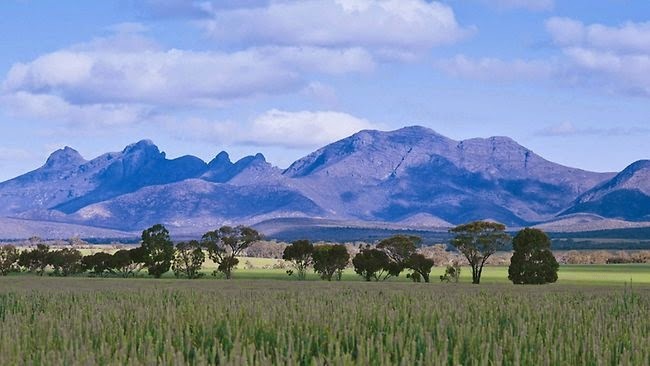 Every day when I was in High School, the Stirling Ranges and the Porongurups near Mt Barker were part of the landscape I surveyed. It is a very simple landscape – a single line of craggy hills, lifted up millions of years ago and gradually eroded into what they are today. When I am there, I feel like I could never get lost. The hills will always give me my bearings. Yet nearly every year, someone gets lost there. They become disoriented or stuck in a place from which they cannot retreat. This simple but complex landscape makes me think of what it may have been like for the Israelites in their Wilderness Wanderings. The landscape was straightforward enough for people to have a generally good idea of where they were, yet time and again they got caught up in trouble – not knowing which way to turn. In this, our final exploration focussed on the OT readings in the Lectionary, I felt like we have a text that is very congruent with what we are doing here today. Today we are celebrating the start of a new phase in Galal’s ministry among us and in particular his Nuba community. It has been a long journey for him – and for Maryam. But along the way I am sure he has had little signs that God was travelling with him. Many things could have happened along the way that could have made Galal divert from the pathway he started out on. But those little signs, and the encouragement of others has kept him on track. And now he is ready to begin a priestly ministry among us. I would like to think that God’s word for Moses can be given to Galal as God’s word for him today. God said to Moses “I know you very well and I am pleased with you.” I think all of us would like to say this to Galal. We know you well. We have walked this journey with you. We have seen you grow in confidence and ability. And we are pleased with you and for you today. But the most important word from God for you today (and for each of us, too, really) is “I will go with you.” Moses believes this is so important that he says to God that if God would not go with them, they ought to stay just where they were. He knew how important the presence of God was. We pray for you today Galal, that you will know that God is with you in your work of ministry among us. We pray that we will, with you, be confident of God’s blessing and presence in all that we undertake together. As we journey together may we catch just a glimpse of the glory of God.